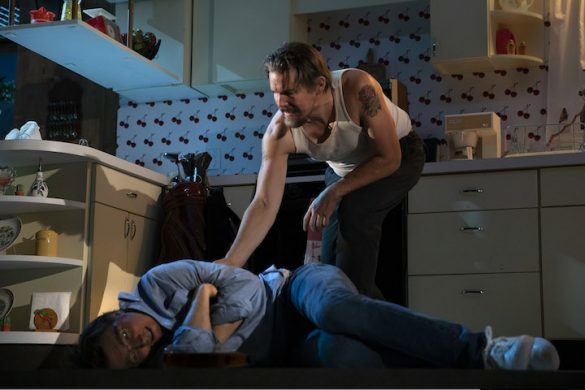 Broadway Blog editor Matthew Wexler takes a trip to the Irish countryside with the premiere of Outside Mullingar, a new play by John Patrick Shanley. Playwright John Patrick Shanley and director Dough Hughes, who each won Tony awards for their work on Doubt (which also earned Shanley the Pulitzer Prize), reunite to bring life to Outside Mullingar, a delicate new work that taps into the intimate relationships of neighboring families in a small, rural town in Ireland. Shanley, perhaps most famous for his Oscar-winning screenplay, Moonstruck, is a master craftsman of language and dramatic construct. 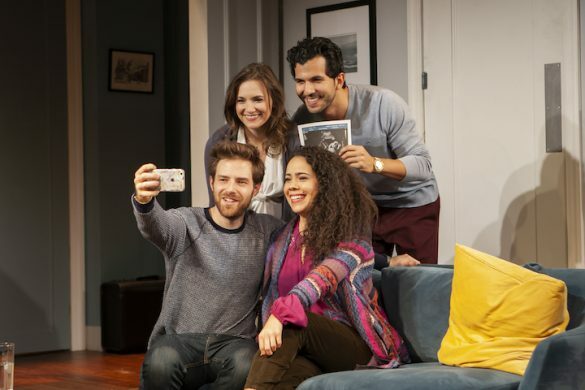 He tightly weaves and unravels relationships that evoke both laughter and tears as beautifully conveyed by the tight-knit cast of four. Tony winner Brían F. O’Byrne (Doubt) and Emmy winner Debra Messing (“Will & Grace,” “Smash”) play Anthony and Rosemary, two introverted misfits straddling 40. Anthony has spent his entire life on a cattle farm in rural Ireland, somewhat miserable in his lot in life. Rosemary lives next door, harboring a childhood grudge while simultaneously yearning for his love. With Anthony’s father (Peter Maloney) threatening to disinherit him and a land feud simmering between their families that includes her mother (Dearbhla Molloy), the light plot unfolds more as a means to explore the themes of love and fate amid the stark Irish landscape. As Anthony, O’Byrne offers a gentle, nuanced rendering of a conflicted man, torn between his familial obligations and unresolved longings. So unaffected is his performance, it at times feels like the audience is merely a fly on the wall—particularly in a poignant scene with his father as the two men come to terms with years of conflict. Messing holds her own with the cast of theater veterans, her emotions and intentions tightly focused by Hughes’ direction. Although her dialect feels forced at times, as if she’s chewing her way through a pint of Guinness, she manages to capture the years of unrequited love that have taken their toll. As Anthony’s father and Rosemary’s mother respectively, Peter Maloney and Dearbhla Molloy might has well have been plucked from a Westmeath pub, so rich and authentic are their portrayals. Outside Mullingar is Shanley’s 10th play for Manhattan Theatre Club—a testament to the company’s commitment to cultivating new plays. He is a master storyteller, able to foreshadow yet allowing relationships to unfold in the most unexpected ways. 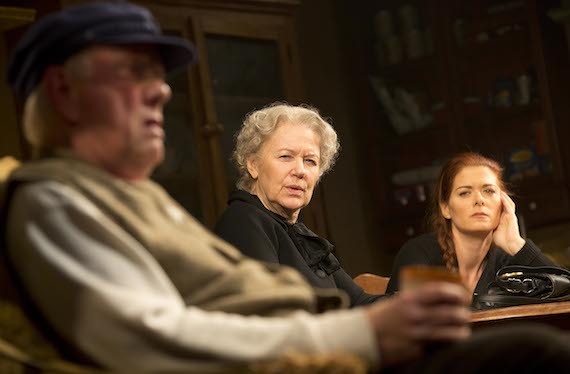 His work is served well by Hughes, who allows the play to breathe, the audience to sit in quiet as well as conflict, and for all to wonder what it must be like to live Outside Mullingar.